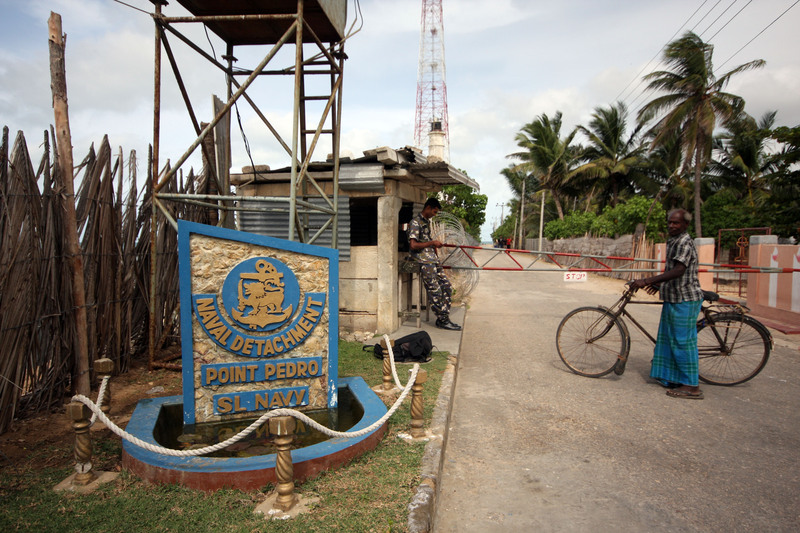 I had thought that Jaffna was a city in an ex-war zone, but as soon as I travelled into Jaffna’s peninsula I realised that Jaffna has been relatively stable for a long time. These areas, on the other hand, still felt markedly raw and bruised by the civil war. People were more guarded and, in general, the atmosphere was tenser. I was lucky. The Keerimalai hot spring had re-opened to visitors only a month previously, for the first time in more than twenty years. I got the last seat in a private mini-bus heading to ‘new’ Tellipalai, perching on a padded bench next to the driver. The old village of Tellipalai was closer to the springs but the whole area had been absorbed into a High Security Zone and all the residents were evicted. My nose was only half a foot from the windscreen and if we’d gone fast I’d have worried a little, but since the minibus stopped at least every 100m it never managed to pick up too much speed. We didn’t set off until it was rammed full, and then, about 2km out of town, we picked up a crowd of school kids and they squeezed in somehow too. People passed their bags in through the front passenger window, beside which was sitting an old man, and he shoved them down under his and my feet, or in the small space between my bench and the driver, behind the gear stick. I could see into the large side mirror and watched young men literally hanging out the side door, laughing, jumping out when we stopped to let people fight their way in or out. The bus terminated in Tellipalai because just beyond here was the High Security Zone, including the Palali-Kankesanturai Military Camp. The bus driver hailed a three-wheeler and told the man I wanted to go to Keerimalai spring – he was obviously given this information by the man who’d helped me at the bus station. They were so solicitous of me, all these people, and they didn’t ask for anything in return. The spring is about 5km away and I was sure the three-wheeler driver was going to quote me some ridiculous price, but he only asked for R200. In Colombo a three-wheeler charges about R70 per kilometre! On the way we passed through the abandoned settlement of Tellipalai, which consisted of ruined, roofless houses surrounded by jungle, and was an eerie sight. Near the spring is the Hindu Naguleswaram Kovil. 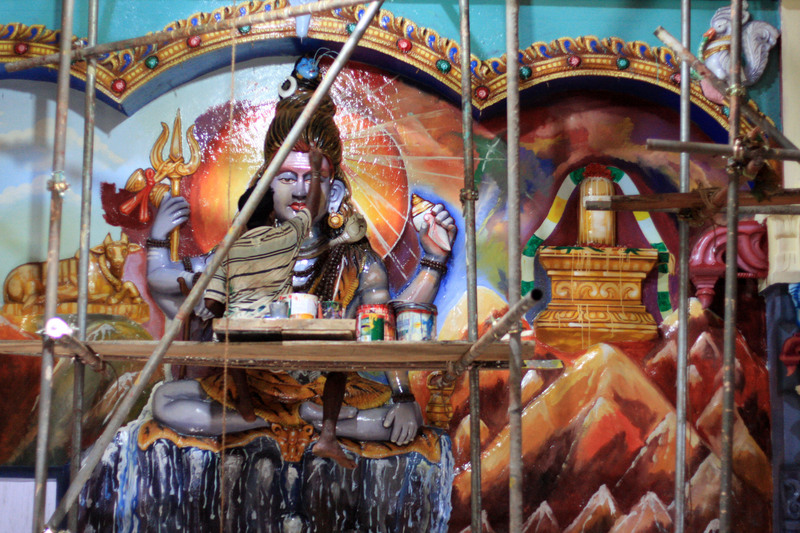 It was in the process of being renovated and several men were painting the walls, and the newly carved gods and goddesses, in bright, gaudy colours. They painted quickly in an expressionistic, almost slapdash, fashion. A smaller temple right next to the spring has, outside it, two of the strangest looking deities I’ve ever seen. One looks like a cross between a goddess, a fish and a one-eared horse, while the other goddess has the head of a rat, except with long curly black hair. 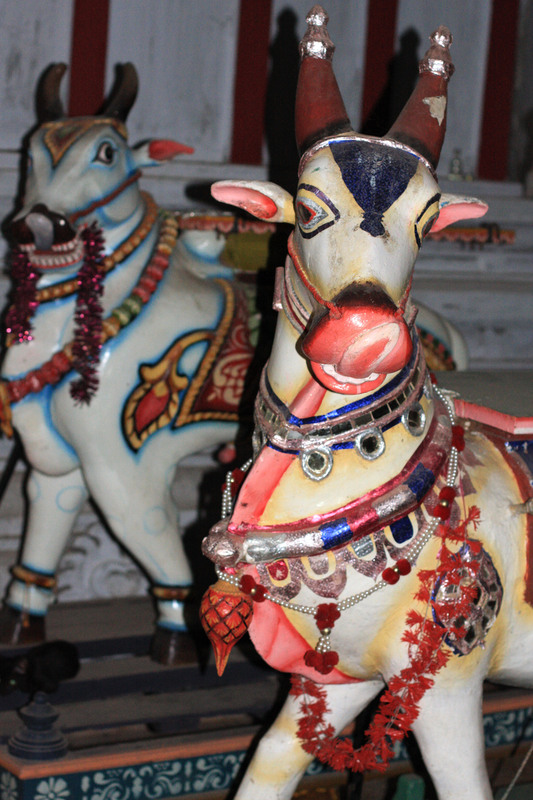 I later discovered that Mahavitapura means ‘city where the horse face vanished,’ and refers to a legend concerning an 8th century Chola princess, named Marutapiravikavalli who had a face like a horse. She was advised by a Shaivite sage to bathe in the sacred spring at Keerimalai, and pray to Skanda. 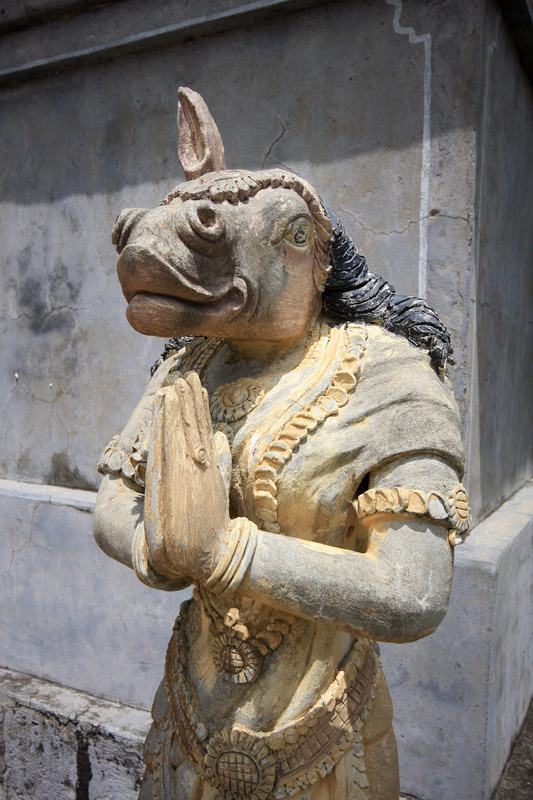 Eventually her condition was cured and she had this temple constructed to show her gratitude. This at least explains one of the weird looking statues near the spring. The sacred spring itself is right beside the sea and there are separate bathing pools for men and women. Typically, the women’s area is enclosed by high walls whereas the men have a lovely view of the ocean. You can look along the coast and see military boats docked in Kankesanturai port. 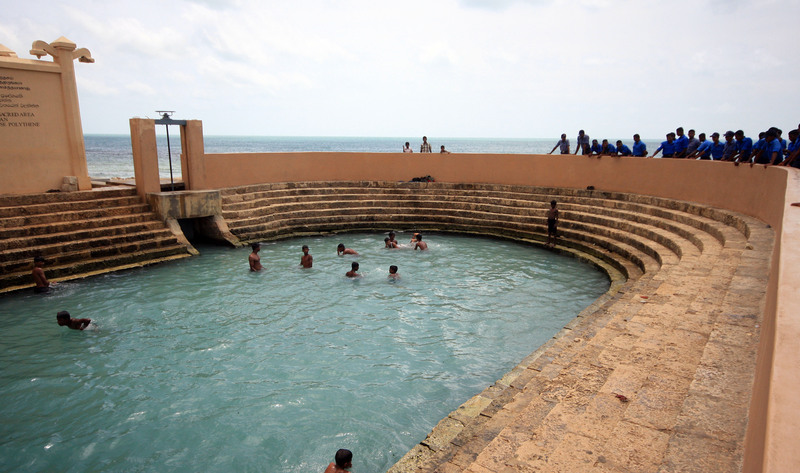 The men’s pool was packed with friendly local boys, many of whom had cycled there from Jaffna. As I watched they showed off their diving skills and played tricks on one another. 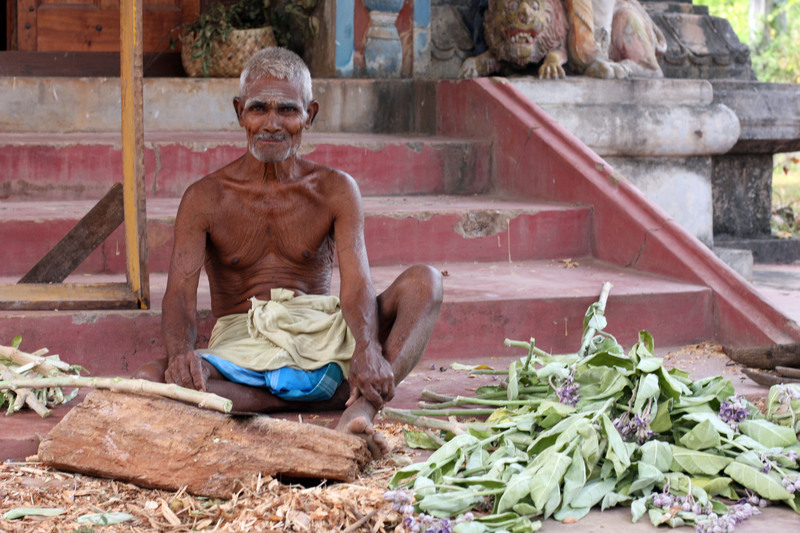 Nearby there were stalls selling coconut, jaggery (sugar from the palmyra tree), and sticks of palmyra to chew on. I hitched a lift back to the main road with a land mine clearing team in a jeep, who told me they’d recently finished clearing all of the old settlement of Tellipalai to the south of the road we were driving along. In the short time the area has been open, people have already returned to reclaim what’s left of their properties and most intend to rebuild. It brought home to me how quickly civilisation can come and go. 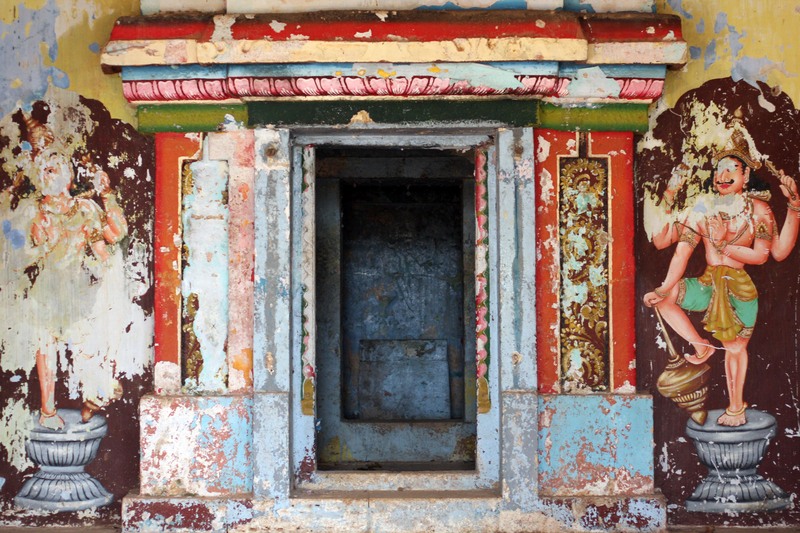 At the turn off to the Keerimalai spring is the Maha Vitapura Shiva Temple, dedicated to Skanda, the God of War. This is also being reconstructed, but they desperately need more funds. The only monks currently looking after the place are an old man and an intelligent young Indian who was brought up in Tamil Nadu but returned here with his parents several years ago. The young monk spoke excellent English and told me he lived with his parents nearby. Before the area opened up, only a month and a half ago, he had special permission to travel in and out of the High Security Zone each day. Things are changing fast in this area and it seems the government is keen to get life back to normal for the Tamil residents. They must realise this is the only way to stop resentment beginning to simmer again, once the terrible reality of the war starts to fade. I took bus 451 to Point Pedro, via Valvettiturai, which is the birth-place of Vellupillai Prabhakaran, the leader of the Tamil Tigers until he was reportedly killed by Sri Lankan army forces in May 2009. As the bus travelled along the coast road I was stunned by the number of ruined houses we passed. I hadn’t realised the effects of the 2004 tsunami had been so devastating here. Money poured into the country from abroad but there was squabbling between the government and the LTTE over how this money should be distributed. 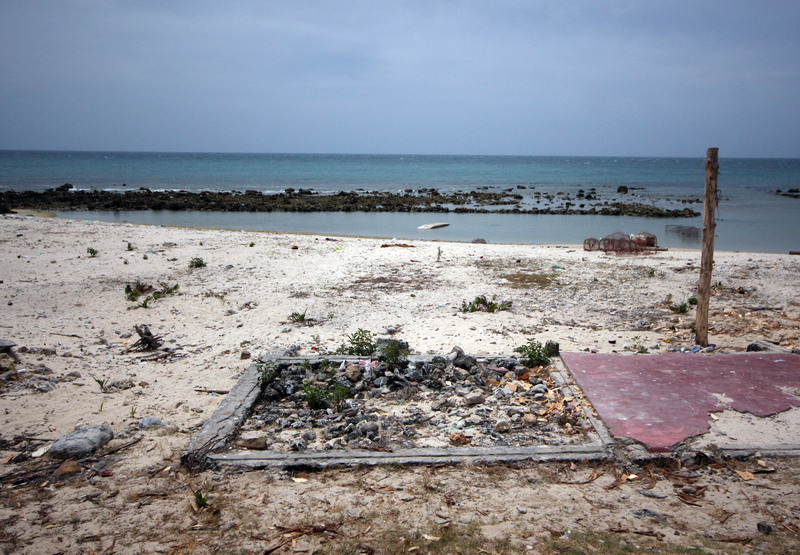 Clearly, not a great deal of aid made it to Point Pedro East: in many cases there was nothing left of the houses but the foundations. Many buildings were also destroyed during bombing raids and the resulting devastation is a sad sight. I didn’t hang around in the centre of town, after eating a ‘special ice cream’ in the Nitharsan Cream House. I walked south and east towards Point Pedro Lighthouse. I quickly learned, on coming up against a lot of barbed wire, that the lighthouse is now out of bounds within a military base. An old man on a bicycle took me up to the main gate, where I bantered with a friendly and educated soldier at the gate, who told me kindly I couldn’t go through. This man had made some effort to learn Tamil and was talking to three locals whose houses were now inside the base. I took a quick snap of the harbour, without really thinking about it, and when we were safely out of sight of the soldier the old man grabbed my arm and started shaking his head, looking incredulous and laughing. He told me, through mime, that people had been shot for that. Oops! I had a wide-angle lens attached anyway so the naval boat looked tiny. Soon after this I met ‘Tom’ ( he told me I didn’t have to change his name but I have anyway), aged 36, from Tooting, London. He seemed a little drunk and manic, but I let him walk along with me, and he turned out to be friendly, although perhaps not entirely reliable. He said he was originally from Palali but his village, near Kankesanturai, was made into a High Security Zone and he was forced to emigrate to London with his parents when he was 13. He came back 11 months ago but said he doesn’t know if can return to Britain, for unexplained reasons, although he has a British passport. ‘My IC (Identity card) is at home, he said. ‘I can show you,’ He also said he had two children in London and had spent time in jail, but I didn’t ask why. He had worked in Immigration. ‘Aren’t they meant to be quite racist in Immigration?’ I asked. ‘Yes they are,’ he laughed, ‘but it’s a job, innit.’ He said ‘innit’, quite a lot, although he had a Sri Lankan accent. He told me, a bit defensively, he’d liked it in Britain. 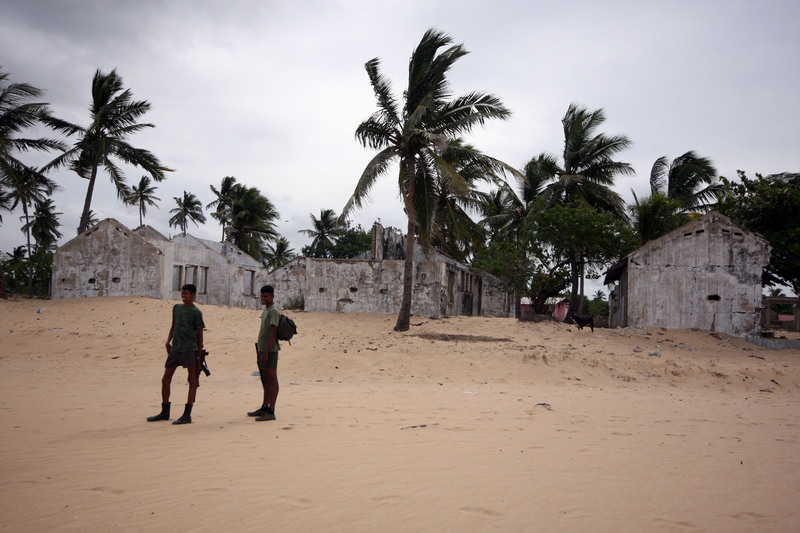 We walked along Munai beach together, past a military checkpoint and then some ruined houses. It’s a lovely, wild beach and I felt like I was at the end of the earth. There were some women and children beside the sea, which was a pretty scene until I learnt that one of the women had been injured by a land mine and lost an eye. I asked her if I could take her photo and she assented, laughing shyly. A woman with her had been grazed by a bullet on her neck. He did admit, however, that the number of army checkpoints have been greatly reduced since he arrived. Before, there was a soldier every 20m or so, now it was only every 150m. We were now on the far side of the military base and he asked the soldiers at the other gate if we could take a short cut back through the base, but they refused. Then one told me I had nice sunglasses. ‘They’re women’s sunglasses,’ Tom said. Would this soldier have tried to take my sunglasses then? I wondered. ‘I’m from Palali,’ he said, ‘but I can’t go back there. The whole area has been taken over by the military. I can’t even go to worship in the church.’ He didn’t look the type to worship in a church anyway, but I didn’t say so. He said that one of the Catholic churches on St Anthony’s Lane was a very powerful place, and when there was trouble people went there to shelter, even though the majority of the people are Hindu. We went to see this church, which looked like part of a cave, except painted bright blue. His ‘sister’ (cousin) was sitting outside the church with some friends and it all seemed very peaceful. Tom thought otherwise and told me several stories about recent atrocities the soldiers had apparently committed. He told me that Vellupillai Prabhakaran, the leader of the Tigers, who was reported killed during the final stages of the war, had in fact escaped and was now in hiding in another country. He also said the army didn’t kill all the LTTE soldiers and whole boatloads of them escaped to Vietnam. I have no idea if either of these rumours are true, but it’s perhaps significant that they’re circulating. I asked if there was anything to do in the evening in Point Pedro and he told me he just hung out with the military boys. There had been a cinema but it was bombed and lost its roof. There was no theatre, no bars and no discos. The bus to Jaffna came past just after that and I jumped onto it, shaking Tom’s hand and feeling quite sad to leave him. I gave him my email address and said I hoped to see him in London. Hey, my grand dad was born in Tellipalai – please tell me, can you travel to the original Tellipalai town now, or is it full of mines? Thanks! most of the Jaffna peninsula is cleared now and telippalai is cleared of all land mines… as for the rumors!!! there lies coz boatloads didn’t escape to Vietnam. the army captured 12,000 LTTE soldiers and sympathizers and rehabilitated them. Tom is worried about a road!!! but under the LTTE rein the tigers did not allow any development work in the former war zones unless it is to their benefit exclusively. 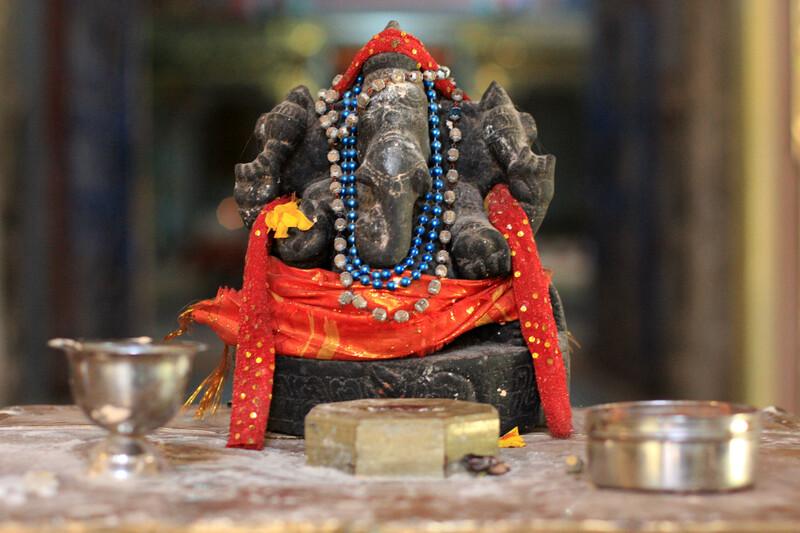 hi….nice work.. the foto named as ‘monk in the maha vitapura shiva templ”….the name of place is not MAHA VITAPURA.. the correct name is MAAVITTAPURAM.